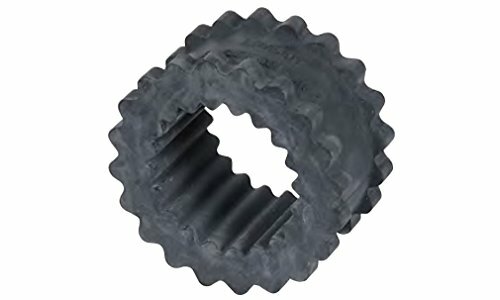 This Lovejoy solid design S-Flex coupling sleeve is for use on the Lovejoy S-Flex series flexible coupling assembly and is made of an ethylene propylene diene monomer (EPDM) synthetic rubber for transferring and absorbing shock load. It is a single, solid piece for applications where the coupled shafts are not difficult to separate, and its teeth help to distribute torsional load across itself and the flanges, reducing wear and extending service life. Lovejoy S-Flex series flexible couplings are suitable for use in applications requiring torsional flexibility and the capacity to withstand shock loads and vibration, including blowers, compressors, conveyors, dredges, feeders, generators, mills, and presses, among others. Flexible couplings are used to link two rotating shafts that are not aligned in order to transmit the rotational power, known as torque, from one shaft to the other. Most flexible couplings consist of two hubs and a middle assembly; each hub attaches to a shaft while the middle assembly flexes between the hubs to accommodate the misalignment of the two shafts. Shaft misalignments are generally either parallel or angular and cause complications to transmitting rotational power from one shaft to another in the form of stresses, loads, vibrations, and other forces, which vary from one type of misalignment to another. Flexible couplings are used in a broad range of applications, such as in motor vehicles, conveyors, escalators, agricultural, forestry and mining equipment, aeronautics, robotics and space exploration, among others. Lovejoy manufactures flexible couplings, universal joints, variable speed drives and various other transmission and mechanical power products. Their products meet the standards of the International Organization for Standardization (ISO), the Deutsches Institut für Normung (DIN), the American National Standards Institute (ANSI), the American Gear Manufacturers Association (AGMA), the Society of Automotive Engineers (SAE) and Japanese Industrial Standards (JIS) for quality assurance. The company, founded in 1900, is based in Downers Grove, IL. View More In Couplings, Collars & Universal Joiners. If you have any questions about this product by Lovejoy, contact us by completing and submitting the form below. If you are looking for a specif part number, please include it with your message.